TheMetalBikini.com- X-Wing Miniatures and more: TheMetalBikini.com sets a new single-day traffic record! 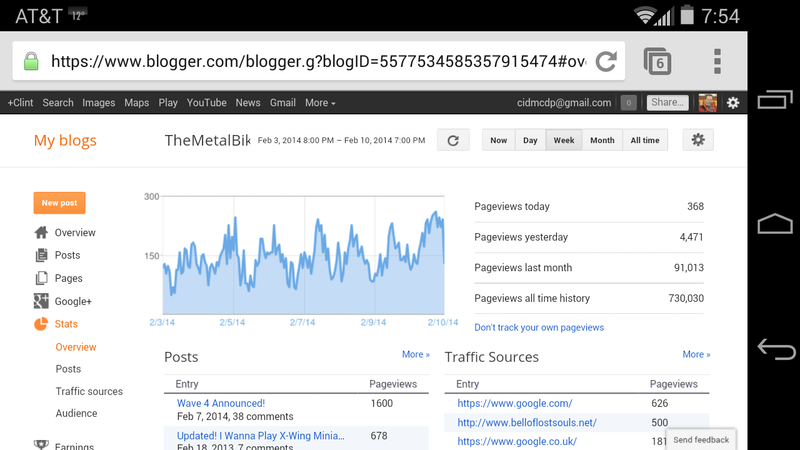 TheMetalBikini.com sets a new single-day traffic record! So yesterday was the most traffic TMB has ever seen in a single day. I'd flirted with 4,000 pageviews a couple of other times in the past, but just never quite made it, so it was really cool to see the numbers get close and finally jump past as I was having a pretty rough day at work yesterday. Also, regardless of how you want to cut it, TMB has been going for over a year now, which is pretty cool too. As my other self-congratulatory posts have mentioned in the past, thanks for digging on my little website blog thingy. I'm hoping to start doing a semi-regular podcast here in the relatively near future, I'm just still working out how best to do it and all, and there might even be some non-X-Wing stuff you might still find somewhat interesting coming down as my birthday is coming up soon and the wife and my folks are going to hook me up with a 3D printer which I've been pining away for around 10 years now. Course, one of these days I may actually finish the 11th round of edits on a novel I wrote like 10 years ago and put that up in some form for y'all to check out too. Who knows? I texted the above screenshot to a couple of my pals today and one of them noticed I'm close to 3/4 of a million pageviews cumulative and suggested I do something interesting for when TMB breaks a million. I'll try and think of something. Anyway, thanks for coming around, thanks for putting up with my unscheduled hiatuses. Hiati? Haiti? Breaks- whatever. And for all the kind words in the emails and comments. Y'all make it fun to talk about this stuff.